The struggle with painting realistic-looking bubbles is to make them appear three-dimensional. Artists often employ several color shades to an object to show how light and shadow play off of it, which in turn gives it depth. Although real bubbles contain many colors and yet remain transparent, blue is often the most commonly used color when representing them in paint. Stagger the spacing of the bubbles. Choose three sizes of a circle template. 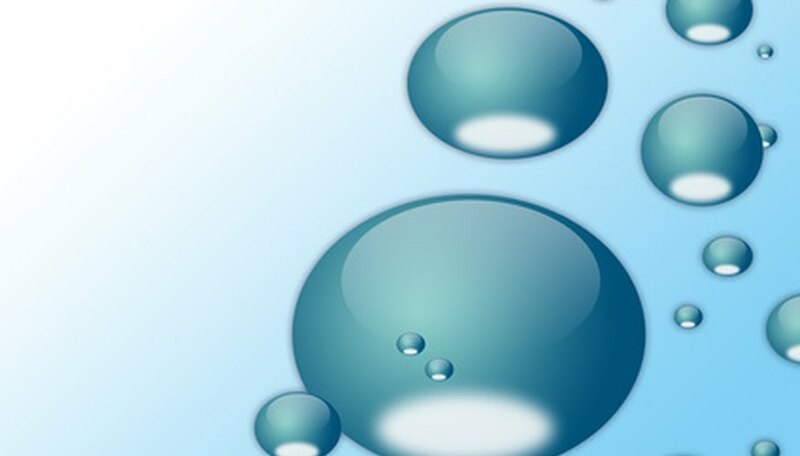 If the painting is to reflect an object that is producing bubbles, the larger bubbles should appear near the object and the bubbles should get smaller as they continue farther away. Although bubbles are transparent, many artists represent them in a painting with various shades of blue. Instead of painting each bubble one complete color, loosely mix several shades together and apply as a base. The brush should apply paint in a circular motion similar to the surface of a bubble. Based on the location of the light source in the painting, paint a white reflection of light on each bubble, using a moon shape. For example, if the light source is above and to the left, the top left-hand side of each bubble should have a moon shape following the curve of the outside of the bubble. Fade the edges of the moon shapes into the bubble color. Paint a larger moon shape in a darker blue tone across from the light source reflection, facing the opposite direction. This allows each bubble to appear spherical. Again, fade the edges of the moon shape into the bubble.